We always appreciate your comments, and thank you for your feedback given at the end of your holiday. Here are some of the things that you have said. We are now back in Cape Town and catching up with emails, hence this late reply. Our weekend on Moonshine was an experiment for us, as we had not tried narrow-boating, and thanks to all of you it was an unqualified success. We have had nothing but positive experiences: the ease with which we could make the booking (and, as travellers from afar, accept your very kind offer of bedding for our party); the clear and helpful suggested itinerary; the masses of useful information for novices like us; Poppy’s friendly welcome, instructions and send-off from Devizes; and the equally friendly and easy hand-back of the boat to Shelly and Poppy on the Monday morning. We were even lucky with our October weather, so whichever rain gods you employ are clearly also doing their bit! As newly converted canal folk, we will certainly look to repeat the experience whenever we are able. We had a marvellous time on “Moonraker”. After a trip with much delay from the Harwich ferry from Holland we were glad to arrive and meet friendly Poppy. She was very patient (language) and helpful. We rented the boat last Saturday, it was absolutely fantastic! We all enjoyed every second and hope to return next summer! Poppy was great! Really helpful and very informative! We’d just like to say what a lovely holiday we had. We would definitely do it again! The whole process of booking and meeting you guys at the Wharf was fantastic – really well organised and very helpful from start to finish! Stuart was just fantastic. We left feeling quite confident after a thorough walk through the boat and great instructions. We bumped into him later on in the weekend at All Cannings and said hello to him and his friends, who told us about a summer show in the village. He was a great representative of your company and one of the main reason’s we’d recommend you to our friends. 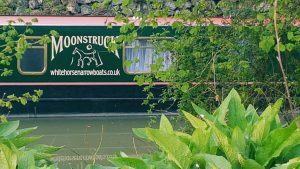 Dear all at White Horse Boats, Thank you so much for your email and for your assistance in providing us with an magnificent few days on the Kennet and Avon canal. We travel a lot as a family and have been to some wonderful places but I can honestly say that last week was one of the most relaxing and enjoyable breaks we have taken in a very long time. It is true that the weather was kind to us (I am glad we did not choose this week) but that is a risk one takes when holidaying in the UK at any time of year. What made this break special was the quality of your boat which was very comfortable and superbly appointed to the point at which the only thing we were going to suggest was to add a chopping board but then we found it! The beds were very comfortable, the bathroom facilities were beyond my expectations and I would urge you to take no notice whatsoever of anyone who suggests that you need to add wi-fi, electrical kitchen appliances or bigger TVs (we never switched it on) to your craft. I would also like to make a special thank you to Poppy and Stuart who helped us to understand the subtleties of what we were embarking upon and how to get the best from Moonfleet which we most certainly did. They knew the answer to every question and exuded professionalism, warmth and kindness in all our dealings with them – they are both very valuable assets.